Design · Interior · What is Living Lovelier? 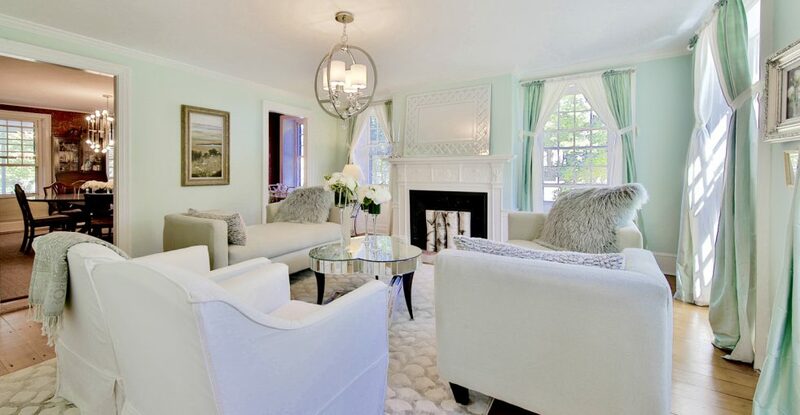 LIVING ROOM TRANSFORMED: Next in Creating Charisma in a Classic Charlestown Condo. Time to cozy up in the living room. I have shared the transformation of two of the rooms, the entryway and kitchen, in the fabulous Charlestown Condo: Let’s hang out in the living room now. The living room and the kitchen share an open floor plan, so it was important to make them complimentary. We carried the same colors, Ben Moore Cumulous Cloud and Grey, into the living room. Sleek chrome and glass throughout accentuate the already bright space. Both keep the room airy. The living room furniture, from Mitchell Gold, are neutral (my FAVorite); The light gray textured sofa and “taupe-y -alabaster” leather chairs are elegant and timeless, yet contemporary. The honey woodwork adds a dimension of warmth to the palate, too. Mr. C is mad for Harley Davidson so, OF COURSE, we found a vintage, black and white print which we hung prominently over the sofa. It was well displayed. A collection of neutrals takes on life when paired with all different textures and finishes: Velvet, chrome, crystal, sheer drapes, mirror, glass, sparkle, wood, pops of unexpected color (we used plum) and black and white. Old family photos personalize the room and the pillows and throws make the room more livable and inviting. One of my favorite “finishing touches” to a living space is pillows. Those featured are from West Elm. Also, draping a few soft throws (from West Elm and Home Goods) here and there is an invitation to cuddle up and gather together. So, the room is elegant but also, warm and comfortable. What are we going to do next? We will visit the library in the following and last part of the series, Creating Charisma in a Charlestown Condo.